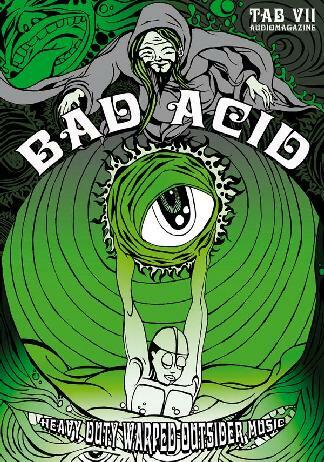 Bad Acid is an amazing magazine with massive amounts of audio and video for a really fair price. Dave, who runs the mag has made a decision with this issue to try out yet another format. So instead of like the last 3 issues coming in a DVD case with a thick printed mag and a CD and a DVD, it comes in a nice glossy fold out with information about what is contained on the MP3 audio CD and DVD. On the CD you get a high resolution PDF file with the mag! I think it is awesome. It is easier to read, the graphics are better and you get a lot of info. Cool interviews and articles with Sons of Otis, A horse called War, Randy Holden, Fuckbuttons, Forever Changing Conept, Rise to Thunder, Helios Creed, Melvins, Celtic Frost and more. The DVD is really cool with live footage of Øresund Space Collective, Morkobot, and Ramesses and Isis. Promo videos by Motley Motion, Vibravoid, Space shuttle Pilots and more. A great value!